I've been in "decluttering mode" lately and as I think about what to get any of my girlfriends for their birthdays, the last thing I want to surprise them with is another "thing" they feel they have to keep around. My solution? 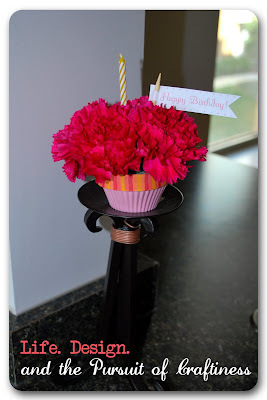 Carnation Cupcakes. No baking required. You can order one from 1-800-Flowers for $25 or make your own. (It's usually green and I've found it at any craft store or the dollar store. Use the height of the muffin cup (see below pic) to cut your foam to size. 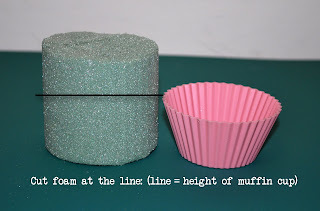 Then, shave down the sides at an angle with scissors until the foam fits snugly into the muffin cup. Mini banner flag attached to a toothpick. These gotta be the prettiest and healthiest little cupcakes you'll ever make! Your friends will thank you for this sweet, homemade, no-calorie treat.... made just for them! Plus, if watered regularly, these will keep at least a week or more, depending on the freshness of the flowers when given. Can't say that about any other kind of cupcake sitting in my house. A colorful set of banner flags!